Booth 4: Booth 4--Don't toss those maps! 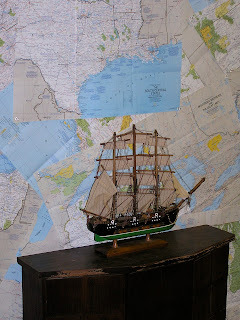 A design tip from vendor #4---Use those Nat Geo maps for a unique wall covering. A great idea for a study area or focal wall in your office or behind your desk. Nothing is permanent--use clear push pins to attach the maps. Make it more personal--use maps of your favorite travel destination and enjoy!